Cheap Print & Send postcard service, Business & Marketing postcard printing. See how fast our cards arrive! 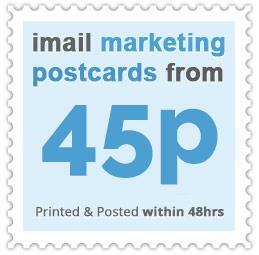 imail marketing postcards are ideal for marketing your business. We offer flexible options to tailor your mailing to any type or size of campaign, from small events to nationwide sales promotions. We have a wide range of generic templates to choose from or our in-house design team can help you with your postcard design. imail marketing postcards can have a great impact to raise awareness about a new service/product or simply increase sales and traffic to your website. Don't just take our word for it, read how imail is helping other businesses now. The flexibility of imail allows any business to use our marketing postcards whatever the event. Our customers have personalised postcards to help market a new business on a small budget. From appointment confirmations, service updates, sales and promotions imail can be used to generate the buzz you need and is an ideal marketing tool for your business. Our cheap postcard printing service can even be used to send your wedding invitations or personalised postcards to your family and friends! Send postcards today with imail and watch your business grow. Try it now for free now. Using our state of the art laminators, imail prints postcards with a high quality, glossy, vivid finish. Our cheap postcards can be used as a great marketing tool to market a new business and will arrive in pristine condition, bursting with life. Bring your images to life with imail postcards. Whether you're sending one or thousands; your postcards are set to stand out on the doormat with imail. Printing postcards online has never been easier, simply upload your image and let us do the rest. Launched in 2008 by UK Mail, as the only alternative to the first class postal service, imail enables users to send letters and marketing postcards with just a click of the mouse from as late as 3pm for next-day or 6pm for two-day delivery. imail has fast become the UK's leading print and mail solution. With innovative desktop to doormat mail delivery solutions imail are making it easier for businesses to send creative, targeted marketing campaigns. The launch of imail's postcards service has given businesses the additional option of either sending business postcards or letters in just 3 easy steps. With ready to use industry specific design templates as well as the option to upload your own designs, imail have taken postcard marketing to the next level. In addition to postcard marketing and letters service, imail also provide a data service. Businesses can purchase tailored, up to date consumer data enabling their marketing postcards campaign to generate better response rates. With business postcards, letters and data services all available from the click of a mouse, imail have encompassed an all in one unique hybrid mailing service allowing businesses to perform and enhance their marketing campaigns all from their desktop. Subscribe to our newsletter and be a part of the imail bootcamp.